THE connections of talented Tasmanian sprinter Tshahitsi have aborted plans to bring the horse home after he scored an emphatic win in the $100,000 Rod Johnson Handicap over 1400 metres at Flemington yesterday. Tshahitsi showed good speed from a wide gate to lead and when rider Brendon McCoull called on the gelded son of Clangalang to extend in the home straight he powered clear of his rivals. The gelding went on to score by over three lengths from Loyalty Man with another Tasmanian-owned gelding Royal Rapture over a length astern. 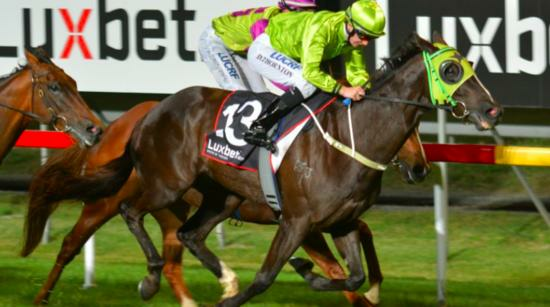 Tshahitsi has been campaigning in Melbourne for the past two months and went into yesterday’s race on the back of an impressive win in the Echuca Gold Cup (1400m) last Sunday week. The gelding’s co-trainer Imogen Miller confirmed the horse would stay in Victoria for at least one more start before returning to Tasmania for a short spell. “We were planning to bring him home after today but it would be silly to do that given how easily he won the race,” Miller said.